Vintage cars… The interiors of a nineteenth century pharmacy… Egyptian mummies… Militaria… Poznań’s museums range from the common to the unique, such as one of only three Museums of Musical Instruments in Europe. Not only tourists enjoy the collections assembled in Poznan’s museums, but also art enthusiasts, book-lovers and enthusiasts in other areas. What’s more, entrance to many is free of charge with the Poznań City Card. The remarkable Porta Posnania symbolically connects Poznań’s oldest districts of Cathedral Island and Śródka. It attracts its visitors with a multimedia display, educational workshops, cultural events and tours. It presents the fascinating history of Cathedral Island and encourages visitors to tour it with an audio guide. The Porta Posnania is a perfect starting point for exploring the city along the Royal-Imperial Route. You can see there the original shows which reveal the secrets of Saint Martin Croissants and other Poznan’s prides. Let’s meet in a beautiful, renaissance tenement house right opposite the Town Hall. The shows are presented live by the locals and prices include croissant tasting! The shows are presented live by the locals and prices include croissant tasting! The museum owns rich collections of Romanesque and Gothic art, paintings by famous artists - Polish (among others Malczewski, Matejko, Wyspiański) and foreign (an overview of 15th-18th century Italian, 17th century Dutch and 16th and 17th century Flemish paintings). In the Poznań collection there is also the only Claude Monet painting in Poland - The Beach in Pourville. The museum is located in the Przemysl Castle. Here nearly 2 thousand exhibits can be seen - from the Middle Ages till contemporary times. The permanent exhibition is entirely devoted to applied arts - and is the only such collection in Poland. On the top of the castle tower there is an observation terrace, which can be reached by lift, or via stairs. 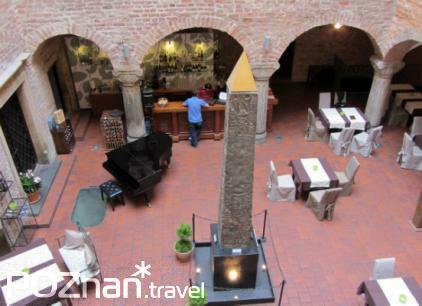 Poland's only actual obelisk from ancient Egypt, tools used several thousand years ago by the first inhabitants of present-day Greater Poland, funerary urns in the shapes of faces - these are some unusual sights that can be seen in the Archaeological Museum in Poznan. This is one of the oldest, largest and most active museums in Poland. The park presents relics of the early-Piast Middle Ages town fortifications dating back to the 10th Century, and the remains of the Renaissance wall that once surrounded the Cathedral Island. In the state-of-the-art audio-visual hall the visitors can follow through the history of the settlement on the Cathedral Island, which began in the 10th century. Since 1954, the Museum has been located in the Town Hall, the old seat of the City Authorities. The exhibition shows the history of the city from the thirteenth century to 1954. The most valuable exhibits includes among others the gilded and enamelled crosier from Limoges from the thirteenth century and a large guild of shoemakers rummer from 1651. One of the few in Europe. Its collection of musical instruments consists of about two thousands items from all parts of the world. The Oscar hall is worth recommending - devoted to Oscar winner Jan A. P. Kaczmarek for the music to the film “Finding Neverland” with the award in the centre. Closed untill further notice. The Museum is located on the premises of the former Fort Winiary (the Citadel). Originally used to make gun powder and shells, the facility was later converted to a munitions depot. The biggest attraction of its permanent exhibition are its outdoor displays of military equipment featuring over a dozen military vehicles, nine airplanes, two helicopters, five tanks, as well as numerous canons and mortars.